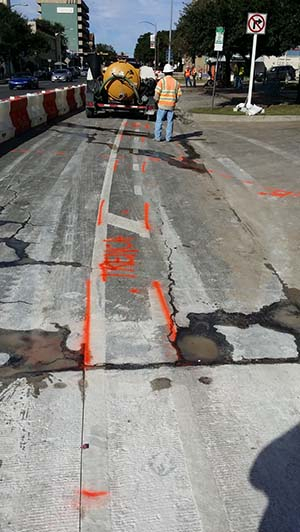 During a utility relocation project in downtown Austin, TX, contractors brought Corey Brecht with GPRS out to the site to help them identify deep utilities such as sewer lines. Previous excavations to install these utilities left behind deviations in the subgrade that were identifiable with GPR. This helped the construction crew identify the precise location of the deep utilities. To see how GPRS can help you find what’s been buried, call Corey Brecht at (512) 417-6105 or email at corey.brecht@gprsinc.com.